Meet the new member of my LV family. It's the most stylish and classic piece I have in my planner collection and can't get enough of it. I instantly knew how to dress her up. Take a look inside! I am currently on the couch with a minor headache watching American Gangster with the hubby. It's not my favorite type of movie so I'm typing this while snuggling with Ricardo on the couch. I just got this planner and couldn't wait to share it. The quality of LV is impeccable and this baby has been on my wish list for a while. But of course it is a luxury item and one that I had to wait on. This is the Louis Vuitton Agenda MM similar in size to a personal size planner. . I also want the GM agenda which is the bigger size, A5 but will hold off for a little longer. I have said once before that I found my unicorn with the Pink Kate Spade Wellesley Planner, but with the LV Agenda I am at planner peace. Here are some pictures so we can drool over it together. This is where I keep my planner supplies on the go. I have a specific space in our house where I keep all of my never ending planner supplies with organized mountains of washi tape along with my filming equipment when I film my videos. But, I also like to carry with me a small amount of essentials when I plan inside my agenda on a daily basis. This one is a cosmetic bag that I recently got from Target. You can find it HERE. This personal size planner is my brain dump planner. Since it's very compact it's easy to carry inside my bag without much weight. I keep my ideas, goals, projects, and thoughts in here. There is also a small section for a calendar and weekly view. I made and customized all of the inserts inside. If you need a little inspiration on how to get started on a personal size planner, watch my latest video. Comment down below what your unicorn planner is. I would love to know. 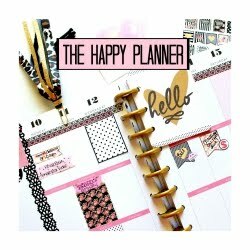 I have a lot more planner videos coming your way on my YouTube Channel Belinda Selene so make sure to subscribe. Have no unicorn planner in mind at this time. Just want to take the opportunity to say how much I love watching your planner videos. Love your enthusiasm!! Can't wait to see more of them. This planner totally inspired me and now I have so many more planner videos I want to film and share with you guys! Thanks for the sweet comment. Yay, so happy you dived in and made the splurge. I absolutely love my LV agendas. I have all three sizes and use each one. I use my pm as my brain dump, my mm is filled with everything that's going on and my GM is my mothership, she stays home but has everything I need. The GM holds financial, blog/YouTube info, family info, everything. My mm holds almost the same but not as detailed. Wow! The GM is definitely on my wish list for Christmas. They are a pricey investment but well worth it. I get so happy writing inside mine it motivates me to keep myself organized. Thanks for sharing love!